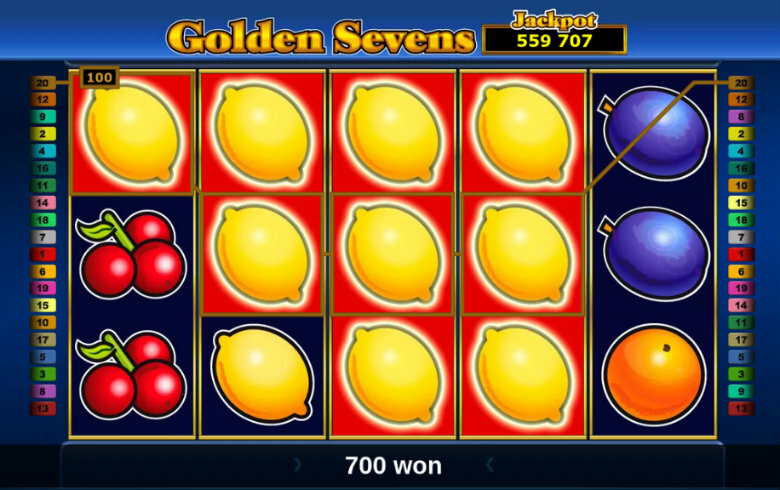 Progressive jackpot hunters can line up classic fruit symbols and play for big wins on Golden Sevens. This enticing slot can be played on desktop or out and about on mobile. It uses crisp graphics and a simplistic play-style to offer endless reel-spinning fun. There are no special features and it’s all about lining up the Golden 7’s for a big win. Golden Sevens slot is not a difficult game to understand but it’s handy to know what you’re looking out for. Click ‘Paytable’ to see the value of each prize symbol combination. From here, you can click ‘More Info’ to read the game rules. The Golden 7’s are the most valuable symbol. Get 5 of a kind to win 5,000x your line bet stake. The jackpot pays when the entire board is filled with Golden Sevens. Winning bet lines pay when active only. Prize symbols must appear in succession from left to right, beginning at the leftmost reel. Getting set up to play is a doddle and requires only two adjustments. Click the ‘+’ & ‘-’ buttons to determine your desired number of bet lines and coin value. You can then either click ‘Start’ to play manually or ‘Autoplay’ to initiate up to 100 automated spins. On any winning combination (barring the jackpot) you will be given the chance to gamble. This is a 50:50 chance of doubling your money or losing the winnings. You can collect after each gamble or keep going until the gamble limit is reached. I the top-right there are options to turn on/off different game sounds and music. You can also resize the screen to suit your device and play in full screen for an immersive experience. Golden Sevens online slot can be played at Bell Fruit Casino. There’s nothing stopping you from playing with bonus cash but it’s not recommended. Yes, you may get lucky and hit the jackpot but you’d be better off playing a lower risk game to meet your wagering requirements. We set up at 2p per line for a total cost of 40p per spin when testing this slot out. It’s a very risky game and we often went 25 spins without getting a return. We did hit some fairly nice wins but on the whole it was mediocre payouts until we ran out of credits. Hitting a 5 of a kind with Golden 7’s is hard enough and this will pay a nice 5,000x your current coin value. Winning the progressive jackpot is no mean feat, as you’ll need to fill every reel with Golden Sevens. 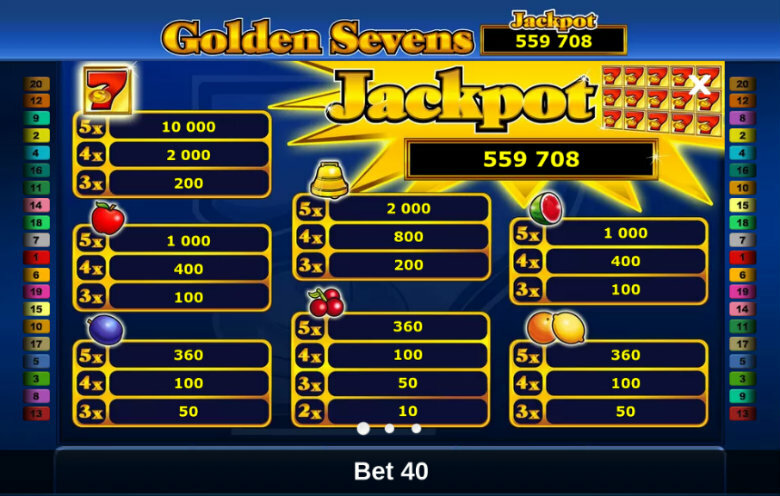 Golden Sevens video slot is an ultra-high variance game that is not to be taken lightly. Tackling this game with a modest bankroll will most likely see you bust out in no time. It’s a game for chasing monster payouts with expendable cash. Wins are extremely hard to come by but this slot has the potential to return some massive casino rewards. The theoretical return to player (RTP) is 95.10%. This gives the casino a house edge of 4.90% which isn’t great news for long-term play. With this in mind, we suggest taking a shot at the jackpot infrequently to avoid any heavy losses. With no wilds or scatter symbols, this is a basic slot. The lack of free spins or a bonus game makes this slot is all about spinning the reels. It’s ideal for players that love nothing better than trying their luck and rattling through the spins without interruption. The animations are brief and do not halt the flow of the game at all. The only pause in play comes with the offer of a gamble on winning spins.